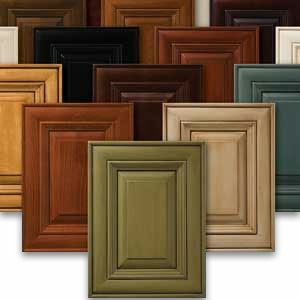 From classic stains to high-end, artistically inspired look of glazing, you will find the variety you need. Decore-ative Specialties brings the same commitment of quality and service to the finishing realm of the custom cabinet industry. Our goal is to bring the highest level of quality, service, and innovation in each project we create as we come alongside cabinetmakers nationwide to make beautiful spaces for living and working. Since 1965, Decore-ative Specialties has focused on providing the highest quality and service as the custom cabinet industries’ source for cabinet doors, drawer fronts, drawer boxes, and accessories. We believe our extensive product offering of doors, moldings, accessories, and sheet goods will supply you with all the necessary components for your next job, which can all be delivered, ready to install, with our beautiful Water-Based Finishes. Let the natural beauty of wood shine through by choosing our durable, factory quality, Clear finish. As with all the Water-Based Finish offering, our Natural Collection is available with multiple sheen options to provide just the look you need. From basics to accents and lights to darks the Original Collection adds warm, attractive color to any interior giving you beautiful, lasting finishes... every time. Exuding elegance, these classic coatings will dazzle any setting. The artful depth and definition accenting of some Choice Collection looks takes beauty to the next level. Providing an economical option where a beautiful painted job and a tight budget combine. Our top-of-the-line designer finishes feature specialty looks that add character and artistic flair for your customers who crave an edgier, more distinctive color scheme. When a solid color is a better fit for the décor, the paint-based finishes in the Elite Collection help you achieve little to no grain appearance. Providing the consistent, clean look of paint, upgraded with high-end accenting for a more artistic appearance, the top of the line Premium Collection will add distinguished elegance to every space. Our collection of cutting-edge coatings provide a beautiful appearance, stunning depth of look, and smooth, touchable feel that will exceed your expectations. We stand behind our high-end factory finish by providing a one-year warranty. Since 1965, Decore-ative Specialties has been committed to providing our customers with superior quality and service. With Water-Based Finishes, get the full spectrum of options you need from the diverse collection of combinations available. From classic stains to the high end, artistically inspired look of glazing, you will find the variety you need. Our high-end factory finish provides repeatable, predictable looks and a durable top coat that protects against fading and yellowing, giving you consistent results you can count on from one job to the next and your customers can count on for years to come. Extensive product testing of our Water-Based Finish line has proven the superior chemical resistance against common household items including water, coffee, mustard, grape juice, olive oil, liquid floor cleaner, and even bleach. Ready to withstand the tests of wear and tear, Water-Based Finishes stands above the rest in durability and chemical resistance. With Water-Based Finishes we challenge everything you’ve ever believed about environmentally friendly finishes by protecting indoor air quality without compromising the beauty and quality of the finished look. Unlike nearly all other coatings available in the market, Water-Based Finish emit minimal Volatile Organic Compounds (VOCs). The impact of VOCs can range from strong unpleasant odors, eye, nose, and throat irritation, and headaches to increased allergy and asthma problems. Using Water-Based Finishes will reduce the inconvenience of evacuation and ventilation after cabinetry is installed, compared to traditional finishes, helping you and your customers breathe easy. Water-Based Finish Custom Options are available if the look you desire is not part of our standard offering. Whether you need a custom match to an existing sample, a color we haven’t brought into our standard offering yet, or a special wood species with one of our Water-Based Finishes, we will work with you to create the look that suits your project. Our Custom Options program allows you to see a sample of your selected options for sign off before placing your order and will require additional costs and lead time for creating your unique look. Along these same lines, if you have a unique wood component in your cabinetry design that is not part of our offering, we can work with you to finish your wood components with our Water-Based Finishes along with the rest of your cabinetry order. We strive to provide you with the solutions you need for a complete finishing program, allowing you to design and create beautiful custom cabinetry tailored to the diverse needs of your clients. For your Custom Option requests and questions please contact our Customer Service Professionals or your local Sales Representative. Everything you need to complete the job and provide the beautiful, high-end look of quality custom cabinetry. We believe our extensive product offering of doors, moldings, accessories, and sheet goods will supply you with all the necessary components for your next job, which can all be delivered ready to install with our beautiful Water-Based Finishes. On the rare occasion that you need to finish some items on your own, we offer the Water-Based Finishes to ensure your cabinet components blend with the Water-Based Finishing products you receive from us. Extensive research produced the precise combination of ingredients for each color selection, allowing you to install beautiful cabinetry with a cohesive look. We will recommend the Water-Based Finishes to go with your selected look when you place your order and will provide application instructions to help you along the way, giving you everything you need to create a stunning space. A great way to keep products with our Water-Based Finishes looking new, a Touch Up Kit can help with repairing minor nicks and scratches on existing cabinetry. The kit consists of a Fil-Stick (used to cover nicks, chips, or scratches), Ultra Mark pen (used to cover minor scratches), Scraper Card (used to scrape off the excess of the Fil-Stik), and White Synthetic Pad (used to wipe off any remaining excess around the touch up area).